Our designers get every detail of your costume to perfection, sending you a sketch to approve before the first stitch is sewn. Thank you for your interest in our company. We take your passion seriously because we’ve stood in your shoes. Many members of our team once twirled, marched, danced, choreographed, composed and played in the band. We know it’s essential to get every costume just right. That’s why we manufacture each one right here in the USA with the highest level of quality. Browsing through our website is easy. Simply click on a costume to see the color options, related male and female costumes and place your order. To customize with a color or design change, include the CCD number of the costume you want and the color you want it in. You change the pants style, skirt, sleeves or other detail by including those details when setting up your order. We will return a drawing of the costume reflecting your color and design revisions. Custom designs are created from the information you provide when setting up your order. 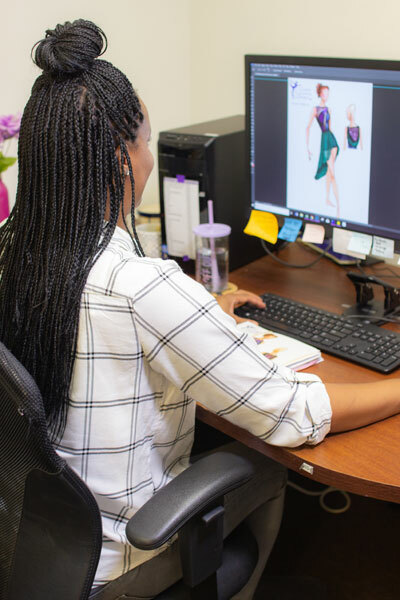 Once a designer has received every piece of information from you, they will prepare a custom design and send a drawing of the costume with design and color details. We love it when you share our designs in the world but keep in mind the drawings sent to you by Creative Costuming & Designs, Inc. (CCD) are copyrighted. They are the property of CCD and intended to be used by CCD exclusively. Click here to start your order by completing your client and show information. Complete ALL of the information about your ensemble, show and costume details and submit. You will receive an email confirmation and an invoice for the $250 deposit. Please contact us if you have any questions regarding this form. This deposit will be credited to your order. Refunds on cancelled orders will be honored if no work or design has been provided by CCD. Pay the deposit invoice by check, school P.O. or credit card. Custom Designs detailed information is available on the Custom Design page. There are a limited number of custom design production spots available during each season. Click Delivery Dates in the header for more information. Website Collection – Your delivery date is determined after we have received your deposit. The time of year is also a factor. Click Delivery Dates in the header for more information. You can select a costume from our website and order it exactly as it appears or you can customize the design with color and materials. Selection of customized materials may increase adjusted price depending upon the material changes you request. Your order is considered active upon receipt of your deposit. Customized Website Costumes – Your delivery date is determined after we have received your deposit. The time of year is also a factor. Click Delivery Dates in the header for more information. Customized website costumes use the published base price but the final adjusted price is determined by the changes you request. Custom Designs – Your delivery date is determined after we have received your deposit. The time of year is also a factor. Click Delivery Dates in the header for more information. Website pricing is available when you click on the picture. There may be pricing changes if you alter the costume pieces or materials. Quotes for Custom Website and Custom Designs will be provided to you when you receive your design drawing. A minimum of 9 identical costumes (design and materials) is required for each order. We will accept orders for less than 9; however there will be an additional fee. See the pricing chart below. Different costumes in a group must have at least 9 people in the same costume style and materials. Minimum order pricing will also apply to post-production add-ons, including REPEAT Parade/Spirit orders. This fee includes artwork, graphic and technical artwork for the print and sample strike off pieces. This charge is non-refundable and non-transferable. CCD will send a sample website costume at no charge after your $250 deposit is received. The sample is property of CCD must be returned sample within 30 days. A return label is provided by CCD for your convenience. Should you decide not to continue with an order after the sample has shipped to you, CCD will deduct $30 for the shipments and return the balance of your deposit to you ($220.00). Fabrics used in sample website costumes are subject to availability. CCD will use the closest color/style of fabric available. Customized website and custom designs prototypes, see CUSTOM DESIGN. Submit measurements through our website portal. Submit all information including height and weight. Missing information could delay the delivery of your costumes. Use Note Section to include details such as style assignment, skin tones, etc. View our video and watch how to measure. Units of measure must be Inches and U.S. Pounds. An electronic invoice will be emailed to the Billing Contact and Primary Instructor names that were submitted with your costume order. The invoice is created when you have finalized your design. 100% Payment due by your published date in the production timeline. Clears order for shipping once complete. All organization types are eligible for this option. School / District-issued Purchase Order for 100% of order total to be received no later than the date provided in the published production timeline. Final invoice sent after shipping. This option is available for payments received directly from Schools, ASB, and School Districts. Independent groups/Booster Clubs – See Options 1 or 3. 50% Payment with completed “Payment Guarantee Contract” by the published date in the production timeline. Credit form is NOT required for payment / PO’s directly from Schools, ASB and School Districts. Click here for Payment Guarantee Contract. The completed form guarantees payment of the balance within 30 days of Final Invoice (sent after shipping). A new Credit Information Form is required for each new order. All organizations are eligible for this 50% option. School purchase orders must be faxed or emailed. A delay in having this payment on file can potentially delay the delivery of your costumes. Upon receipt of your costumes, please open boxes immediately and fit performers as soon as possible. If you find any discrepancies to the costume you received please let us know within 7 days of receiving the costumes. Once we have received this information, we will assess and determine the next step. Please do not have costume altered without contacting CCD if you feel the costume was not constructed properly. All shipments will be made by UPS or Fed EX Ground Service unless otherwise requested. CCD must have required payment on file before we can release orders for shipment. Add-on/Prototype costumes must be paid full before shipment. *Ground shipping charges will be waived if 100% payment is received prior to published due date on sales order. PLEASE NOTE: REFUNDS ON SHIPPING CHARGES WILL NOT BE GIVEN FOR DELAYS OCCURRING ONCE UPS IS IN POSSESSION OF THE PACKAGE. THIS INCLUDES DELAYS CAUSED BY WEATHER, TRANSPORTATION ISSUES, ETC. Alaska, Hawaii and all other shipments outside of the US will incur additional shipping rates. That rate will be determined upon invoicing. If you would like us to use another UPS shipping service other then what is listed above such as Saturday delivery, the rate will be determined at time of request. Do not soak or leave wet in a pile. Do not wash in a machine. “Delicate” or “hand” cycles are not the same as hand washing. Do not use Arm & Hammer deodorant. Do not use Woolite soap. Cover your costume when using hair spray or perfume. Use Windex to get out grease or oil stains. Put costume on and make sure the waist and crotch are in the right area. Stand up straight and look straight ahead, have someone else mark the bottom of the pants where they hit the floor behind the heel of the foot. Remove the costume and fold the pants so the legs lay on top of each other and are flat. At the mark, cut straight across the leg to the other side thru both legs.